BBQ baked potato is a staple on game day in our house. Football games on Sundays have become a new tradition, along with the appetizers which go along with it. It must be the powerful seasonings with which each potato is rubbed or the massive amounts of shredded cheese on top. Whatever the reason these are such a hit, I’m sure happy that they are easy to prepare. Now, since I hate scrubbing pans, I line my baking sheet with foil. All the potatoes are tossed on my baking sheet while getting my seasoning and oil together. Then, I rub each potato with olive oil and a bit of the seasoning mixture and pop it in the oven for 50 minutes. Once the chicken is shredded and swimming in the bbq sauce, pop it in the oven along with the potatoes for twenty minutes. Basic math suggests that you wait until the potatoes have been in for 30 minutes, leaving 20 minutes remaining. Once everything is done baking and out of the oven, allow it to cool for a few minutes. 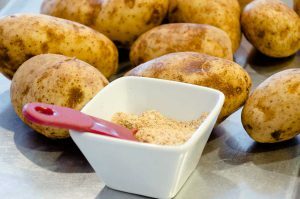 We’ve all heard that children’s song “hot potato.” That song exists for a reason…it’s warning to those who lack enough common-sense to wait a few minutes before consumption. This next part is easy. Be creative. Bust that potato open and fill it with your guilty pleasures. I like to add butter, bbq chicken, cheese, additional salt and pepper, sour cream, bacon, and chives. I’d love to hear what you add on yours. This recipe can be used with any bbq meat you have on hand. Share your variation in the comments! 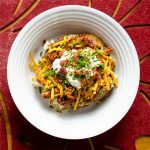 Baked potato rubbed with powerful seasoning and loaded with barbecue chicken and your favorite toppings. Wash and dry the potatoes. Stab each potato with a knife or fork several times to ensure even cooking. In a small dish, combine the seasonings: salt, pepper, garlic powder, paprika, and parmesan cheese. Line a baking sheet with foil and rub potato with olive oil and the seasonings. Bake the potatoes in the oven for 50 minutes or until fully tender when poked with a fork in the center. (if you prefer a softer potato skin after baking, wrap each potato in foil before baking). 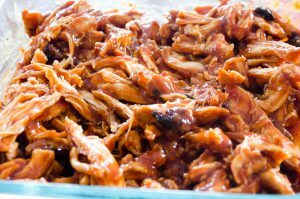 Shred the cooked chicken breast and place in a small baking dish and combine with the bbq sauce. Coat all the chicken with the bbq sauce. When the potatoes have been in the oven for 30 minutes place the chicken in the oven on a different rack. The chicken and the potatoes should have about 20 minutes left to bake. Once the chicken and potatoes have finished baking, remove them from the oven and allow to cool for five minutes. In a bowl or on a large plate, place the potato and slice an “X” with a knife. Scrape the potato’s insides (the white part or orange, if using a sweet potato) to loosen it from the potato’s skin. 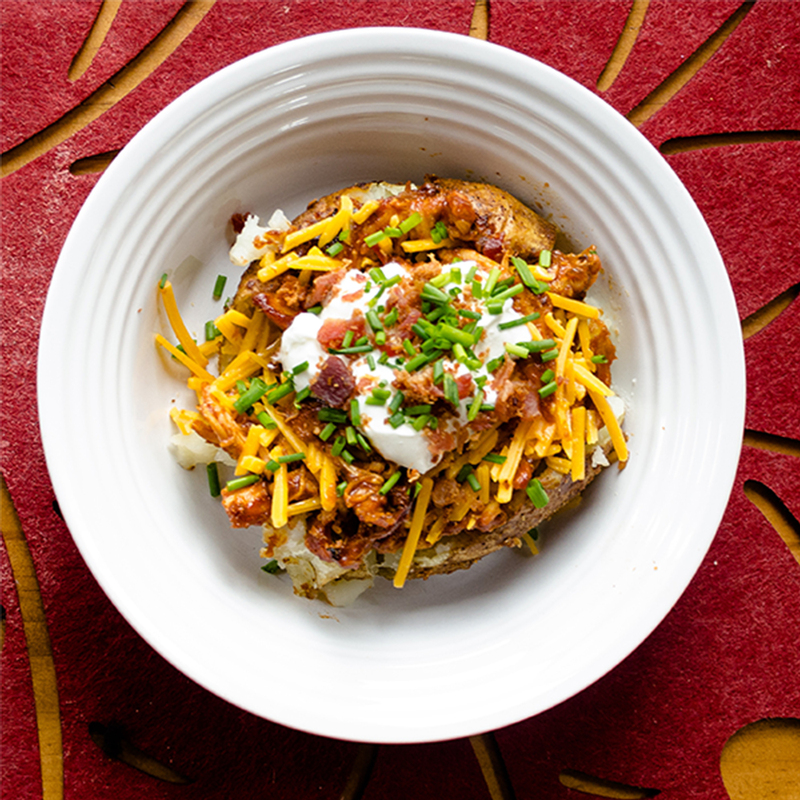 To the inside of the potato add butter, bbq chicken, cheese, bacon, sour cream, and chives (or whichever toppings you prefer).